Soothing bath salts to relax the mind, body and spirit made with 100% pure Himalayan Bath Salts; distinguished by their beauty and content of a variety of trace minerals which are essential to our overall well being. 100% pure Himalayan Salt scented with the relaxing, sweet fragrance of a lush floral garden, in a natural light salmon color. 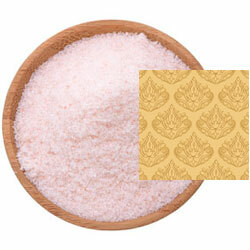 Benefits: A mineral rich, therapeutic bath salt that promotes relaxation for a good night's sleep. Ingredients: Himalayan Salt, Fragrance, Tocopherol (Vitamin E), Aloe Barbadensis (Aloe Vera) Leaf Juice.